I had to get these up on the blog straight away; I’m far too excited. The Blackberry Jam Shea Scrub Cubes by Marshmallow Blends arrived in my order this morning and when I removed the metal lid, the smell was just intoxicating and my saliva glands went into overdrive. If you’ve not heard of Marshmallow Blends, it’s a homemade and handmade cosmetics business set up by South Yorkshire based beauty blogger, Nicoletta. I reviewed some of her products 3 years ago here. I’ve known Nicoletta a few years now since the early days of the her brand and she’s grown from a small online shop, to a gorgeous online shop and her own store in the heart of South Yorkshire. I am in love with her products (particularly the unfortunately discontinued Caramel Cupcake Body Scrub – it was like sandpaper, I loved it and so perfect for guys) but her current offerings just get more and more gorgeous. I love the fact that she controls her own products and isn’t tied down my a marketing team, a development team and a sales team; she’s a one woman band and calls all her own shots. 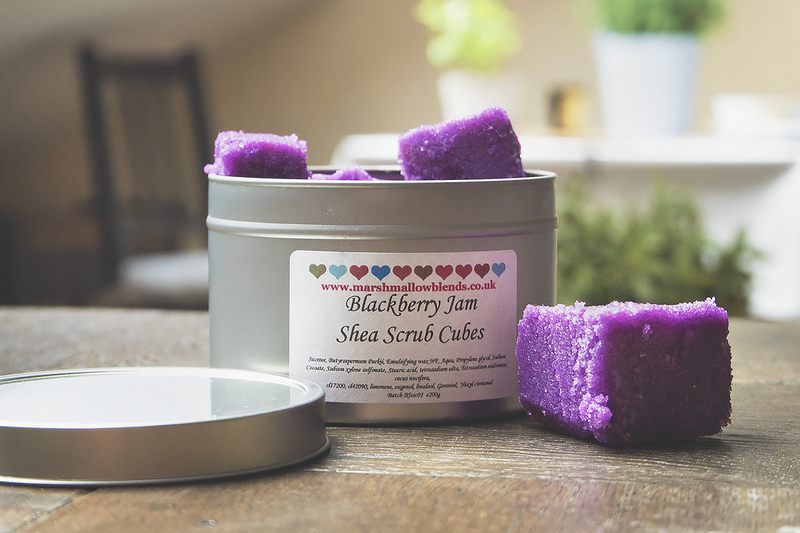 This results in some absolutely gorgeous products you might never have seen before, the Blackberry Jam Shea Scrub Cubes being just one of them. Where do I start? They’re cooked up on a base of sugar and Shea butter which both exfoliates and replenishes moisture at the same time. All of Nicoletta’s body scrubs foam which is why I keep going back for more again and again. They adhere to the skin giving you plenty of opportunity to get the scrubbing goodness to work. I mean how many times have you bought an intoxicating sugar/salt body scrub for it then to flop off your wet skin and onto the shower floor or dissolve entirely into your bath; or even worse, leaving you with a sugary bum crack! I find all her product fragrances wildly authentic; the Cupcake Body Scrub smells like warm, freshly baked cupcakes and the Blackberry Jam Shea Scrub Cubes are no different – I’m half tempted to spread it on my toast, although probably shouldn’t. OMG, where can I buy these? What makes me sick to my stomach after spending small fortunes over the years on Body Scrubs is that these are only £6 for a pot of 6 hefty cubes and you use between 1/2 and 1 cube per go. I am also now absolutely desperate to try the Rhubarb & Custard Scrub Cubes, one of my favourite old time-y boiled sweets. I can’t begin to imagine how gorgeous they’ll smell. This article first appeared on MANFACE written by Thom Watson. It was published on Friday 10th April 2015 and was last updated on Monday 3rd April 2017 at 1:30pm. It's categorised under Body, Exfoliate, Marshmallow Blends where you'll find more related content. These look amazing! Not tried anything from marshmallow blends though I’ve heard of them – must remedy that and soon! I love that these create foam – there was a local gal that made some around here, and they.. just left me feeling like I rolled around in a grease pit, not a pleasant feeling – especially when I already have oily skin. Handmade products are so easy to get wrong but MB are so consistent. Maybe she’ll post to the U.S.? These look amazing, I need to step up my skincare routine so badly! These sound amazing, although I’d half worry I’d end up eating them if they smell that good! Might have to pick some up, it’s a really affordable price for what sounds like a real quality product – love the ‘one woman business’ ethos too! Wow. These sound amazing. I must try these out. The rhubarb sounds good too.